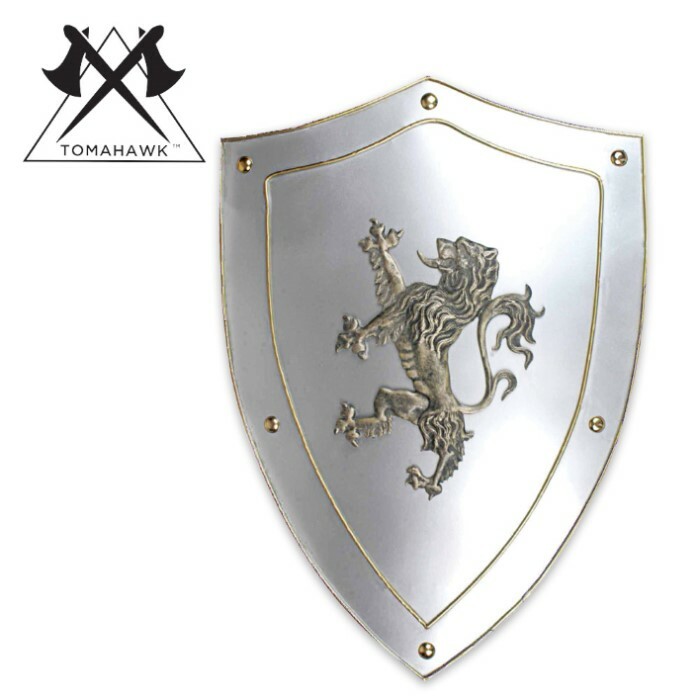 This classic cast metal medieval shield is sure to draw attention at the next renaissance fair! Measures 24 3/4" tall. 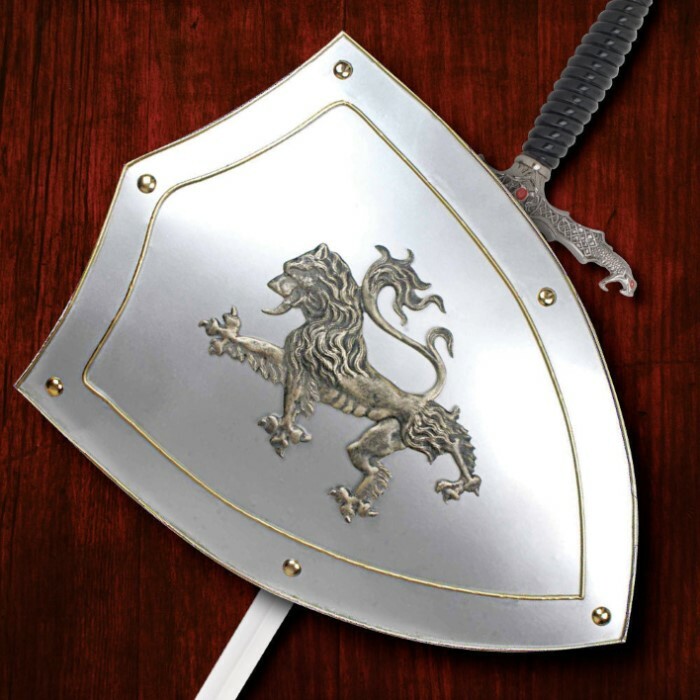 Bought this as a decorative piece for the Lion Rampant, symbol of Scottish royalty, on the shield. My great grandparents emigrated from Scotland and I visited the area in the old country from which they came last year. Couldn't resist the symbolism and the shield looks impressive on the wall. I don't believe it's suitable for real swordplay but that's not why I bought it. The previous reviews were helpful in making my decision. Just received my shield yesterday; looks great as a wall decoration, role playing toy, or on a mannequin as I put mine. I made my own suit of armor with a mannequin and medevil pieces I bought separately and the shield looks great on his arm. I would recommend this piece for anyone wanting a wall piece, role playing of on a mannequin like I put mine. Looks Awesome!! This is a beautiful shield, a great display and costume piece. Extremely light weight, and the lion is much more detailed than pictured! My only complaint was that upon arrival the tail of the lion was broken off, and there are a couple of small dents in the shield. The tail was easily glued back on, and the dents are easy to overlook. And honestly, a dented shield is cooler, it looks used lol. I will say it could have had a little more padding in the box though. Still, a nice piece. Kinda rough around the edges, like it has dents, but otherwise looks good. Great looking shield, but I wouldn't bang on it or decoration might chip off. It came with a chain on back for hanging as well as handle and strap for carrying. Can be fixed for right or left hand carrying although the velcro arm strap is not that great, but it works. Well worth the money.